My fall garden is always bursting with greens, many of which are sharp-flavoured mustards. Along with a little plot of mustard greens grown for use in the kitchen, I also use mustard as a late-season cover crop to suppress weeds and soil-borne diseases. Fast and easy to grow, mustard dresses up the fall garden with its frilly or colourful leaves. Mustard is always best as a fall crop, unless you want to grow seeds for grinding into spicy condiments. Growing mustard for seeds is best done in spring, because lengthening days trigger mustard plants to produce flowers. 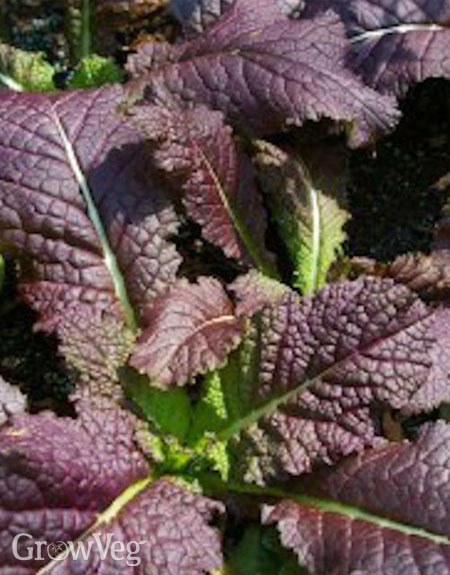 Technically, many popular Asian greens including mizuna and tatsoi are mustards, but varieties with broader leaves are synonymous with garden mustard. The ‘Southern Giant’ or ‘Green Wave’ mustard varieties are popular for their beautifully curled leaves, while ‘Florida Broadleaf’ has a strong track record of out-producing other mustard varieties grown for greens. And then there are the red mustards like ‘Red Giant’ and ‘Osaka Purple’, which are among the best edible ornamentals for the fall garden. Mustard seed germination is fast and sure, so you can simply scatter the seeds over a renovated bed and then pat them in with your hand or the back of a rake. Within two weeks the planted area will be transformed into a sea of green, with very few weeds. I thin plants being grown for greens to a hand’s distance apart, and use the young greens pulled while thinning in stir-fries if they pass my taste test. Mustard greens that grow in warm weather usually have very strong flavour, which gentles down considerably as nights become longer and cooler in the fall. Fortunately, mustard plants are very willing to regrow should you opt to lop off and compost huge handfuls of summer-grown mustard greens. Within two weeks, a flush of tender new leaves will emerge from the plants’ centers. Mustard greens have no problem with light frosts, but temperatures below 20°F (-7°C) usually kill plants back to the ground. Before this happens, I chop down the old plants and mix the chopped roots and greens into the soil, because rotting mustard tissues suppress nematodes and several common soil diseases. If this is the main benefit you want from mustard, simply grow your mustard as a cover crop. A few weeks ago, one of the last things I did before leaving on vacation was to sow mustard in the beds where I had just harvested spring carrots and early potatoes. Less than a month later the beds are wall-to-wall mustard greens, with hardly a weed in sight. When sown in late summer, mustard grows so vigorously that weeds are smothered into submission. Rather than eat all those mustard greens, I will chop them up using a sharp lawn edger, and then quickly turn them under using a digging fork. Numerous studies have shown that live mustard plant tissues, both seeds and roots, contain compounds that work as soil biofumigants by killing nematodes and pathogenic fungi. Reaping this benefit requires handling mustard like a green manure, because the beneficial compounds are released within hours after the plants are chopped down. But if you wait two weeks after turning under chopped mustard and then plant lettuce, you can expect a very productive crop with very few weeds. Potato and vegetable farmers have begun using special mustard varieties as part of their rotation practices to suppress weeds and diseases. 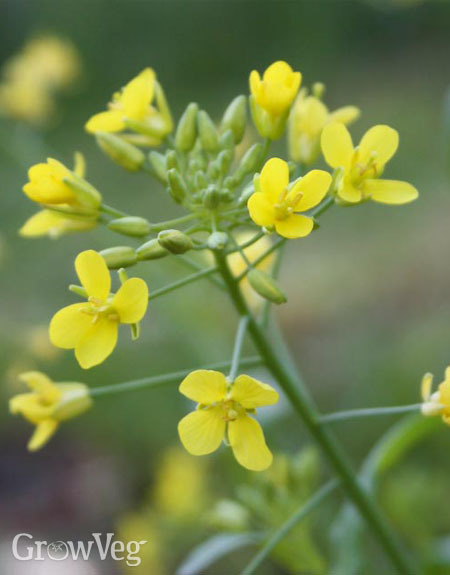 The method involves planting selected strains of mustard bred to produce high levels of glucosinolates in spring, and quickly chopping them up and turning them under in summer, when they reach full bloom. Used this way, mustard has a cleansing effect on soils that are carrying heavy pathogen loads. Mustard varieties to try for this purpose include Caliente, IdaGold and Kodiak. Adventuresome garden cooks who want to experience natural spices at their best may want to grow mustard seeds, which have endless uses in the kitchen. You can toast and crack them for a crunchy, big-flavor garnish, grind a few with mortar and pestle to season sauces, or soak them in water for a day before blending with olive oil, vinegar and various other spices to make your own mustard. Recipes may call for yellow, brown, or black mustard seeds. Seeds produced by most varieties of good-tasting mustard greens are mild-flavoured yellow mustard seeds, just like the ones sold for pickling. The cover crop variety mixtures named above yield spicier brown seeds. Black mustard seeds (similar to brown ones) are popular in India and often can be found where fine spices are sold. In any colour, edible mustard seeds are dried at low temperatures to preserve their flavour compounds, so they are often viable when planted in the garden. To grow your own mustard seeds for eating, simply grow a few nice plants in spring, and stake them if necessary when they bloom and set seeds. When the seed pods dry to tan in midsummer, gather them in a paper bag and let them dry until crispy, then crunch thoroughly with your hands and gather the seeds that fall to the bottom. "Can you recommend a supplier of organic mustard seed? I live in Ontario, Canada. Many thanks." "If you go to www.seeds.ca, you can click to mustard and it will generate a list of suppliers, by variety. Most Canadian seed companies that specialize in organic seeds sell several varieties of mustard." "I live in central Virginia and use fresh mustard greens in my fruit and greens shake for better health. It has really helped. Which variety would be best for my purpose? Thanks, Betty Dotson "
"Betty, there is a variety called Vitamin Green, I think sold by Johnny's Selected Seeds and others, that is slightly higher in nutrition compared to other mustards, so it might be the best choice for juicing. Kale works well in smoothies, too." "I have a book about cover crop (Plantas de Cobertura do Solo), edited in 1991 and translated to spanish by CIDICCO (Honduras). Now, I'm improving it and so, I'd like to include a photo of mustard. It's possible to send me a photo, with place, author, year and institution or farmer? Excuse me for the my bad english." "I am a new gardener and have plants Red Giant starts in my little kitchen garden. The plants themselves are about 10 inches high and they are beginning to have small yellow flowers at their tops. Should I cut these flowers off, or let them go. I want to enjoy the "greens" in my salads, so I don't want to use the plants as a green manure crop just yet. I'm in the Seattle area, so it's very cool here still. thanks for any help you can offer!" "The appearance of flowers indicates that your plants are in reproductive mode, and will not be producing tasty new leaves. For salad use, you will need to sow new mustard seeds every two to three weeks. Lengthening days trigger mustard to bolt, so the plants will not stand in the garden as long as they do in the fall. You can eat the flower buds and flowers, then chop the plants into your compost." "I have mustard growing now, starting to bolt and I am looking for a good crop to put in after I pull the mustard. I like frozen greens so I am thinking of spinach, Bloomsdale probably. Does anyone have suggestions for what to plant after mustard for a late summer/fall crop?" "Will, I think this blog on midsummer crop rotations will give you some good ideas: https://www.growveg.com/guides/plan-ahead-for-midsummer-vegetable-crop-rotations/"
"Hi, Where can I obtain Indian mustard seeds in Australia? Thanks!" "Where can I obtain Indian Mustard seeds in Australia? thanks!" "The easiest thing to do would be to start with brown mustard seeds from a specialty food store that carries them as spices. If they germinate, you have your seeds. Online, The Seed Collection (TheSeedCollection.com.au) has several varieties listed as Brassica juncea, which is brown mustard. Eden Seeds (EdenSeeds.com.au) has a couple of the specialized mustard varieties used as biofumigants." "I don't know how to grow mustard. will mustard grow in all soil or any other soil is specially needed for it?????" "Mustard will grow in any soil, but without additional nutrients the plants will be small in very poor soil. You have little to lose by trying a small planting to see how it does. " "I have started growing dill and it had sprouted out,but i find some small insects roaming in the pot.I don't want to use pesticides. what should i do now? " "The best non-insecticide that might impact a number of pests is diatomaceous earth, which is made of fine, sharp particles that injure the insects' bodies. " "my plants had spoiled due to rain.what should i do now? " "If only the tops are injured but the roots are possibly healthy, put them in a dry spot and see if they come back. It could happen. Since dill is fast to grow from seed, why not start some more? " "What mustard varieties are best for home made mustard? I wanted to grow the plants and let them go to seed and use the seeds for mustard. Thank you for this informative article." "Eva, You can make a spicy Dijon type mustard from brown mustard seeds produced by regular garden mustard, but milder-flavored “white” mustard seeds come from a different plant, Sinapis alba. It is much hairier than regular mustard, so you would grow it only for seeds, not for greens. Good luck!" "Thank you, Barbara. Is Sinapis alba the same as "Yellow Mustard" seeds? I just ordered some of these as in the description it said that it is the most popular variety for "yellow" mustard. I was also thinking about planting some of the seeds that I got from Asian market, some are yellow and some black. Eva"
"Because mustard seeds are such fast germinators, you have little to lose by trying to grow out food-grade mustard seeds. Mustard seeds sold for sprouting are another possibility. Sounds like a fun project!" "what effects can you have on mustard plants after you grow it in compost?" "what effects can a mustard plant have after it is planted in compost? would the results of the mustard plant be effective?" "Kaylee, there only reasons to grow mustard in compost would be to clear awful soil-borne diseases, or to increase biomass for more composting. I would use mustard to build soil that needs improvement, and use your compost in garden beds or rows. " "Is the spicy white root safe to eat? I tried a tiny piece and was wondering if i should throw away or peel and use as a spicy addition." "Yes! Mustard roots are edible, and can be used to make a grated relish, like horseradish, or you can pickle them in vinegar." "Thank you Barbara, I thought they would be enjoyable but was hesitant (afraid of poisoning myself)"
"If mustard plant clean the soil by removing pesticides and pathogens, wouldn't turning the crop under just return those thing back into the soil?" "Kathy, mustard does not clear pesticides, but plants that do (such as mushrooms) are unfit to eat, so you have a good point. It's the "mustard gas" released from the freshly chopped mustard foliage that has fungicidal properties, thus reducing soil-borne fungal diseases. "